Good morning friends! Today is Day of Giving Friday where I have a card to give away to one of my wonderful readers. I just love layering dies, it gives cards the extra prettiness and depth that say ‘this is special’ and beautifully handmade with care. Layering and the variety of textures leads the eye right in to the sentiment on this card for a special little highlight. Now you can’t pile everything on, but most of us have these dies in our stash and there’s nothing like layers to help you use those things you’ve collected. The card uses those classic dies we love so I thought I’d give you a quick run down. The base of the card is made using Spellbinders Decorative Labels Eight and Spellbinders Labels Seventeen. If you’re not familiar with how to make a hinged base for a shaped card – I have a quick tutorial HERE. For the frilly prettiness I’m using as the focal panel on the card I stacked from the bottom up using Spellbinders Delicate Doilies, Spellbinders Classic Circles SM, Spellbinders Venetian Motifs and lastly an element from the Delicate Doilies set. The background is embossed with a portion of Spellbinders Framed Petite Labels Embossing Folder. As always, welcome new readers! Just to bring you up to speed, every Friday it’s my pleasure to give away a card. The card goes to a randomly picked reader (worldwide) who leaves a comment in our conversation. Want to know more about Day of Giving, here’s a link to my FAQ’s just check out #11. For your comment today – How long have you been giving handmade cards, is it a way of life for you? 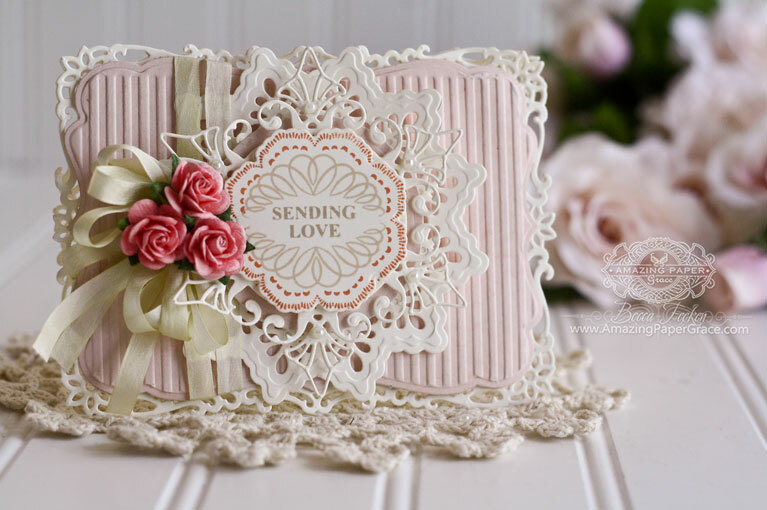 Accessories: Spellbinders Decorative Labels Eight, Spellbinders Labels Seventeen, Spellbinders Delicate Doilies, Spellbinders Classic Circles SM, Spellbinders Venetian Motifs Spellbinders Framed Petite Labels Embossing Folder, Silk Ribbon, Mulberry Flowers Have a spectacular weekend! So glad you stopped by!! Lovely card Becca, so pretty! I have been card making for 10 years, and I’m still obsessed, at the moment its Altenew, and of course the Art Deco Spellbinders! I can’t imagine buying a card anymore! This is one of your prettiest ever! Love it and think I have all the dies to make it. I have been making cards for about 8 years and following your since about 2009 and you have given me and others many good tips. Thank you so much and have a beautiful weekend my friend. oh goodness you just keep getting prettier and prettier. I’ve been card making 01 January 2005 and yes it is a way of life now. As soon as I hear of someone’s birthday or life event I think ‘I must make them a card’. Shop bought cards just aren’t personal enough. I love the beauty of the card today. Your layers are perfection. I have been giving handmade cards for at least 16 years and have never bought a shop card in that time. But before that I made my own gift tags using dried flowers, leaves and fruit. I have been crafting since I was a child for a total of at least 65 years – mainly sewing, knitting and crochet. Once again your card is simply over the top gorgeous. I absolutely LOVE your stunning and amazing cards always. I´ve been giving my handmade cards for the last 15 years I think, and it sure is a way of life for me, as it means a l.ot to both me, and those who recieve my cards, that they´re made very personal to the recipient. And I can´t imagine, what people would say, if they suddenly didn´t get a handmade card from me, and all our family and friends directly expect it. My grandkids always come running and asking, what I´ve made for them this time, even before, they get their presents, so it tells me, that they really do apreciate them. Another gorgeous card, Becca. Absolutely love it! I’ve been making and sending hand made cards for about 13 years now. I only make them for myself and not to sell, although if any friends want a special card made I will do that, on condition they don’t insist on paying for them. I do it for pleasure and if ever it becomes a chore (which it hopefully never will) I will stop! Best wishes. Good morning, Becca! Such a pretty card, this Friday! I’ve been giving handmade cards for oh, decades? Certainly more reliably in the last 10 years or so…maybe a little longer. I love being able to take the time to love and pray into the card I’m making – spend that time for the person it is going to. And I find the same even when creating for my business line – that care and joy going into my product, even though I’ll never know the recipient. It’s just as rewarding. Wow, Becca. Just wow. That is gorgeous. It may be my new favorite! I love the layers – you are such a genius with the layers – and I love how you are using some of our old favorite dies. It’s good to keep those oldies in circulation, and not neglect them for the newbies. Oh my! Another stunner, Becca. I’ve been making handmade cards for over 12 years – and yes – it has become a way of life and a joy! The house is full of card, inks, dies, punches, stamps – you know – the usual lol! I have been giving handmade cards ever since I started stamping. It’s been about 15 years. I give them for every holiday and special occasion to certain family and friends and to everyone on my Christmas card list. I also enjoy making sets to give as gifts. I missed Valentine’s Day this year and people noticed. This card is stunningly beautiful. 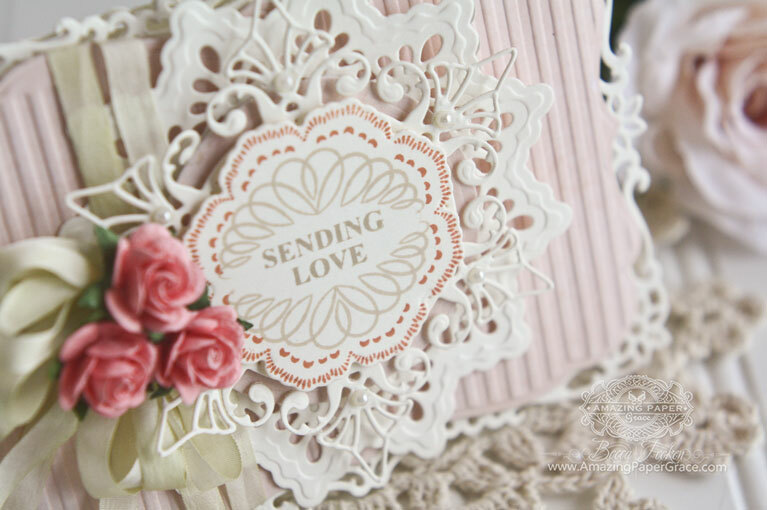 Ii love everything about it from the embossing to the bow, flowers and all the gorgeous die cut layers. Just when I think I’ve seen my favorite, a new favorite shows up. You definitely inspire me to want to create! I began papercrafting in 2001 with the birth of my first grandchild, Noah. I actually resisted card making until about 5 years ago. 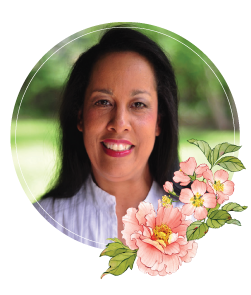 It wasn’t that I didn’t want to give cards away, it was that I was just very passionate about preserving memories for my Grandchildren. I want to leave my view of their lives for them when I’m no longer around. When I finally made my first card, I was hooked! I love love love creating cards and giving them away! You are a master of layering! You amaze me with your elegant eye that can place these intricate layers atop each other so they work so harmoniously with each other. Making handmade cards is a way of life for me now but it hasn’t always been that way. About 30 years ago I decided to make handmade Christmas cards. That became an annual tradition and has expanded from there. Now, I make cards for myself and others. Making beautiful cards really feeds my soul. I think my total well-being depends on it! I’ve been making cards since 2009. It is a way of life for me. I love making and giving them. Some I don’t want to give up! Yikes! Becca what a beautiful card and love the panelling you have done on the base. I have been making cards for over 10 years and have never bought a card since I started. While they are not always perfect to me it is a way of life. Hi Becca, I always love how you make layers that I never would have even thought about.Your pink cards are always among my favourites. Though it took my confidence another 7 years before I started to make more. I was always worried people would think I am being cheap, until one day I was trying to get inspiration & googled something. I stumbled upon your blog! That was 1 year ago! You have no idea, as it could have not happened in a better time in my life. A time I felt confused & lost my confidence in many aspects of life. Since then your blog has been a massive inspiration & I have learnt so much. People that receive my cards know they are receiving an original piece, made from the labor of love with hours and care taken to complete. My cards don’t always look as perfect as yours lol, but I can say I no longer fear what they think. Now I just get the odd comment like, “isn’t it just quicker to buy?” Lol They’re the ones that don’t get it! Becca, this is absolutely stunning! I have most of the dies and how clever you are to use the embossing folder as you did here. I always pick up techniques and ideas from your cards. WOW What a beautiful card! I love the layered delicate cards! I have been creating cards for about 20 years. My favorite card to make is using the spellbinder dies. Yes it is my way of life I’cant imagine having to buy a card way too expensive! Thanks for the chance to win your card. Take good care & God bless you! Gorgeous creation Becca. Giving handmade cards has been a way of life for me for about 15 years – love being able to give personalised cards. have used the embossing folder and covered the label part ! long as I was worried they were not good enough lol. I have been making cards for about 25 years and just love it. I started by using stencils. then learned how to do parchment cards with inks, pens, piercing tools and now use embossing folders, punches and dies. It is a wonderful hobby and I just love it and always interested in taking courses to learn how to make different cards. Your cards are beautiful and inspire me very much. Beautiful card Becca….would love to win it!!!!! I started with photography and made my pictures into cards and then I walked into a stamp store in 2007…a passion was born!!!! Hand made cards are a delight to make…and to receive! STUNNING card!!!! Oh my gosh! Love the texture with the soft colors. Big sigh. Oh, you went and did it again, another absolutely gorgeous card, and I love it when you create pink and white cards, they are so springy. I’ve been giving hand made cards for about eight years and I so enjoy making a card for a particular person or occasion. Another gorgeous card Becca! I started making Christmas cards about 18 years ago and haven’t looked back. I make cards for all occasions but Christmas cards are still my favorite. Yes it’s a way of life for me and my kids “shop” in my extras. Stunning Becca, just stunning. Really beautifully made card but then again, I would expect no less from you anymore. It is a real inspirational piece for me. I have been making cards most of my 65 years and got fairly serious about it about 12 years ago just about the time I had my accident and series of back surgeries. Making cards was something I could do rather easily and it allowed me to keep my imagination moving forward and was so much better for me than just sitting and watching television. What a beautiful and romantic card, Becca! The most beautiful card, love it. Stunning card. I love the embossed pink layer, but you are going to have to explain how you did that. Did you emboss first and then die cut????? However you managed to accomplish this, I love the effect. Please clue me in. Thanks. Wow Becca !!!!! this card is stunning !! I adore all the layers, they are so pretty and layer together beautifully. I didn’t realise how you had got the corrugated background paper, I would never have guessed you had used this embossing folder, how effective is this !! I love it. I have been giving handmade cards for about 10 years, I have never bought a card to send in all that time, it is definitely a ‘way of life’ for me, and I love it !! Well Becca , this card is. Simply stunning !! What an amazing card to receive! Better late than not! Attended my #3 daughter’s(age 46)graduation from the University of Texas San Antonio where she earned a Masters of Public Policy/Social Work. So proud of her! Just returned home to your precious Friday card. So diminutive! I have been a hand weaver since 1986. In 1996 we moved closer to our #2 daughter who was hosting a Stampin’ Up party. I was invited and I was hooked. I found that I could make something pretty with colors and texture, satisfying that immediate need to create. Weaving a cloth takes weeks, but I’m still lovin’ that, too. Morning Becca, this is a gorgeous card love all frilliness of it if that is a word. I have been giving handmade cards for about twelve years now couldn’t buy a card now I would feel so guilty. We are so glad for all the inspiration you and all the wonderful crafters give us.